Overall, there are clear trends and relative changes in the five indicators as affected by the four paired practices (Table 1, Figure 1A to D), but the spread is large (Figures 2A to D). a Q1, first quartile; b Q3, third quartile; c SD, standard deviation; d N, number of observations; e SOM, soil organic matter. dark green, median > 1.5. Values >1 indicate positive effects. A ratio of 1 or close to 1 indicates there was no change or no difference between “promising” and “standard practices” (blue line); > 1 indicates a ‘positive’ change (increase) vis-à-vis the respective reference practice, while < 1 points at a ‘negative’ change (decrease). For most indicators, a median ratio > 1 is considered favourable from a soil quality perspective. However, pH results have to be interpreted more cautiously depending on the pH range (i.e. acidic, neutral or basic) of the soil type and the crop involved under consideration. Also, while the differences are very pronounced for earthworms, the magnitude thereof has to be interpreted with care because of the generally low number and high spread of observations. Figures 2A to D show the spreads of the observations, with median values (in the boxes) and lower and upper quartiles per management intervention and land quality indicator (AS: aggregate stability; SOM: soil organic matter). OM addition favourably affected all five soil quality indicators under consideration as shown in Figure 1A. The most favourable effect was reported for earthworm numbers, followed by yield, SOM content and soil aggregate stability. For pH, effects depended on soil type, for example OM input may favourably affect the pH of acidic soils. These results are similar to those reported in other reviews (Khaleel et al., 1981; Haynes and Naidu, 1998; Abiven et al., 2009). Increases in SOM content depend on the amount and types of OM applied, and the duration of application. The equivalent amount of tested organic materials, i.e., compost, farmyard manure and slurry application increased SOM contents by 37%, 23% and 21%, respectively in the upper 10 cm and values tended to increase with the duration of experiments (>10 years compared to < 10 years) until a new equilibrium was reached (Spiegel et al., 2015). Based on analyses of 42 LTEs from China, Xu et al. (2015a; 2015b) concluded that straw application of 7.5-12 Mg ha-1 y-1 was needed to restore the SOM content to initial levels under current cultivation practices. From a practical perspective, however, it should be noted that such amounts of straw may not always be available for application on the land (e.g. used for cooking and brick making). No-Tillage (NT) comprises land cultivation with little or no soil surface disturbance, the only disturbance being during planting. Figure 1B shows the impact of NT on the selected soil quality indicators compared to conventional tillage. NT generally led to increased aggregate stability and greater SOM content. With respect to the SOM content, the median RR for the whole data set (n=19) is 1.21 (Figure 2, no-tillage versus tillage). Median RR values for SOM range from 1.02 for maize (n=3), 1.20 for winter wheat (n=6), 2.12 for barley (n=64) and 1.48 for other crops (n=11). NT practices enhanced earthworm populations, but not always where herbicides or pesticides were applied to combat weeds and pests. Overall, in this review, yield slightly decreased under NT with a median RR of 0.98. For winter wheat, the median RR is 0.81 (n=38), for maize is 0.85 (n=3). Overall, however, the sample populations were too small to adequately tease out such effects. Similarly, other studies indicated that no-tillage led to improvements in soil quality in the upper soil layer by improving soil structure and enhancing soil biological activity, nutrient cycling and reducing bulk density (Hamza and Anderson, 2005), thus improving soil water holding capacity, water infiltration, water use efficiency (e.g. Islam and Weil, 2000; Pittelkow et al., 2015) and aggregate stability (Aziz et al., 2013). For yields, there were no clear trends, as such are ultimately determined by many interacting factors (Pittelkow et al, 2015; Zhao et al., 2017), such as crop type, the detailed consideration of which was beyond the scope of this review. Tillage per se does not directly affect soil pH. Rather, effects of tillage on pH depend on the prevailing climatic conditions, parent material, soil type, and management factors such as the application of chemical fertilizers or lime. For example, wet compacted soils favour denitrification. Such soils may show a reduction in pH, making other nutrients less available to crops (Cookson et al., 2008; Lal, 1997; Rahman et al., 2008; Rasmussen, 1999). A change or difference in tillage practices can result in changes in biological, chemical and physical properties of soil, affecting the soil function (Chan, 2001; Islam and Weil, 2000) and its capacity to provide ecosystem services (Funk et al., 2015; Palm et al., 2014). In this context, NT represents a relatively widely adopted soil management practice in Australia, South America, US and Canada, but not in Europe. 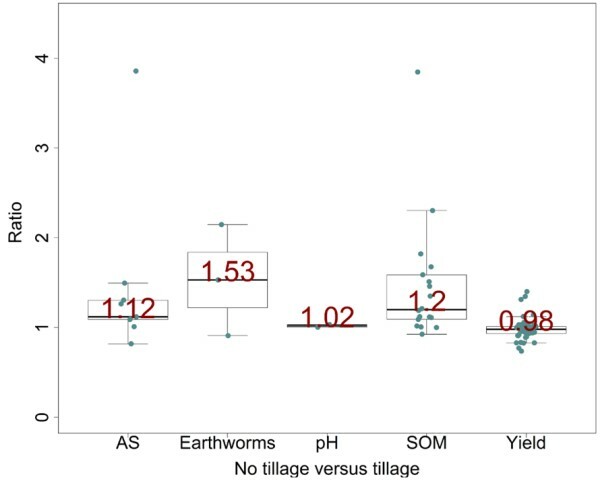 Crop rotation had an overall positive effect on earthworms (number), SOM content and yield (Figure 1C), but it had little impact on soil pH and aggregate stability - depending on the type of crop. Limited impact of rotation on soil pH was also reported by Spiegel et al. (2015). Favourable effects of crop rotation on SOM levels and yield were reported by various reviews (e.g., Bullock, 1992; West and Post, 2002; Jarecki and Lal, 2003), and neutral impacts on SOM content by Spiegel et al. (2015). The limited effect of rotation on aggregate stability was presented in other studies (Arrigo et al., 1993; Castro Filho et al., 2002; Spiegel et al., 2015). Conversely, for 22 LTEs in Europe, Guzman et al. 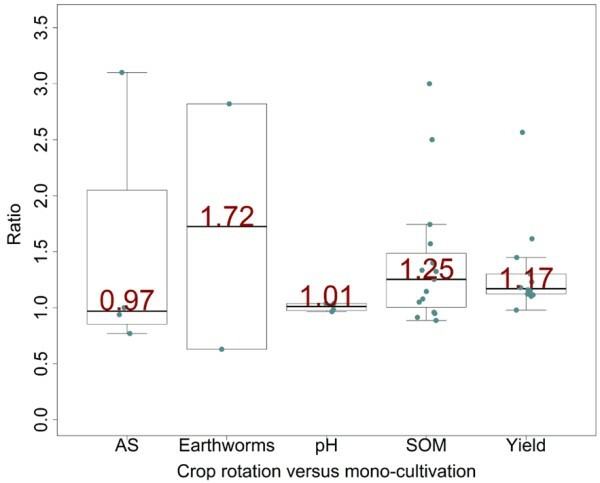 (2015) observed a negative impact of crop rotation on aggregate stability, i.e., response ratio (rotation/mono-cropping = 0.77) and no clear trend in earthworm numbers. 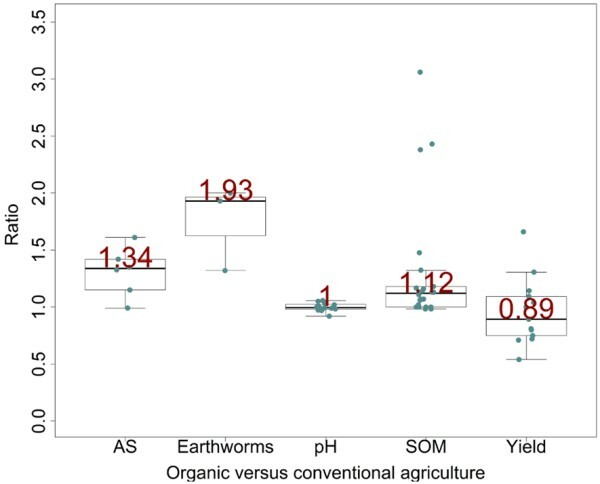 Figure 1D shows a clear positive trend for earthworm abundance under organic agriculture. Organic agriculture generally resulted in increased aggregate stability and greater SOM content. Overall, no clear trend was found for pH. A decrease in yield under organic agriculture was observed, with median values indicating an ‘organic yield gap’ of 11%. These results are similar to those reported by Gunst et al. (2007), Zhang et al. (2007), Scoones and Elsaesser (2008), Mondelaers et al. (2009), Stolze et al. (2000), Gomiero et al. (2011), Gattinger et al. (2012), Romanyà et al. (2012), Seufert et al (2012), Song et al. (2012), Tuomisto et al. (2012), Wortman et al. (2012) and Ponisio et al. (2014). Alternatively, some studies reported no significant differences in yield under organic cultivation compared to conventional agriculture (e.g. Eyhorn et al., 2007), or even higher under organic management (Melero et al., 2006). Although the ‘organic yield gap’ is widely reported, it is also recognised that judicious land management can help to decrease it. For example, Ponisio et al. (2014) reported that agricultural diversification practices (multi-cropping and crop rotations) substantially reduced the yield gap when the methods were applied in purely organic systems. Other studies have shown that organically managed cropping systems have lower long-term yield variability (Smolik et al., 1995; Lotter et al., 2003). Nine local studies on the effect of organic farming on soil pH (Condron et al., 2000; Gosling and Shepherd, 2005; Marinari et al., 2006; Melero et al., 2006; Eyhorn et al., 2007; Heinze et al., 2010; Reganold et al., 2010; Ge et al., 2011; Domagala-Swiatkiewicz and Gastol, 2013) confirm how remarkably small soil pH differences are between organic and conventional systems (on similar soils). In six out of the nine cases, pH is slightly but not significantly lower in organic systems, with all observed differences being < 0.4 units. In the Swiss DOK experiment, soil pH was slightly higher in the organic systems (Mäder et al., 2002). Generally, soil pH depends on the soil type and its buffering capacity, and the type of organic fertilizer or soil amendment applied. It is therefore of paramount importance to specifically consider the local soil and management conditions. 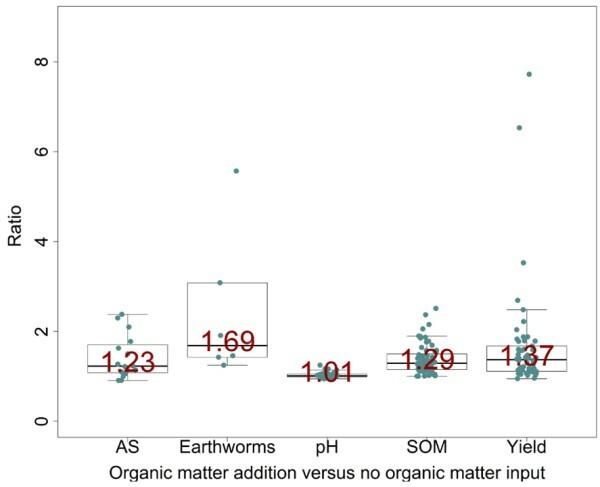 There is a close relationship between organic matter content and aggregate stability (Loveland and Webb, 2003). Various studies confirmed that organic farming significantly improved aggregate stability compared to conventional systems (Jordahl and Karlen, 1993; Gerhardt, 1997; Siegrist et al., 1998; Mäder et al., 2002; Schjønning et al., 2002; Williams and Petticrew, 2009). Besides enhancing soil water retention, organic farming seems to improve water use efficiency, especially under drought conditions this can lead to organic crops out-yielding conventional crops by 70–90% (Lotter et al., 2003; Gomiero et al., 2011). Finally, higher organic input under organic farming systems leads to a more vibrant soil life, which in turn creates a more stable soil structure (Tsiafouli et al., 2014).